Shiga toxin (Stx)-producing E.coli O157:H7 has become a global threat to public health; it is a primary cause of diarrhea-associated hemolytic uremic syndrome (HUS), a disorder of thrombocytopenia, microangiopathic hemolytic anemia, and acute renal failure with thrombi occluding renal microcirculation. In this study, we explored whether Stx triggers complement-dependent microvascular thrombosis in in vitro and in vivo experimental settings of HUS. Stx induced on human microvascular endothelial cell surface the expression of P-selectin, which bound and activated C3 via the alternative pathway, leading to thrombus formation under flow. In the search for mechanisms linking complement activation and thrombosis, we found that exuberant complement activation in response to Stx generated an increased amount of C3a that caused further endothelial P-selectin expression, thrombomodulin (TM) loss, and thrombus formation. In a murine model of HUS obtained by coinjection of Stx2 and LPS and characterized by thrombocytopenia and renal dysfunction, upregulation of glomerular endothelial P-selectin was associated with C3 and fibrin(ogen) deposits, platelet clumps, and reduced TM expression. Treatment with anti–P-selectin Ab limited glomerular C3 accumulation. Factor B-deficient mice after Stx2/LPS exhibited less thrombocytopenia and were protected against glomerular abnormalities and renal function impairment, indicating the involvement of complement activation via the alternative pathway in the glomerular thrombotic process in HUS mice. The functional role of C3a was documented by data showing that glomerular fibrin(ogen), platelet clumps, and TM loss were markedly decreased in HUS mice receiving C3aR antagonist. These results identify Stx-induced complement activation, via P-selectin, as a key mechanism of C3a-dependent microvascular thrombosis in diarrhea-associated HUS. Shiga toxin (Stx)-producing Escherichia coli (STEC) O157:H7 is a foodborne or waterborne pathogen, responsible for worldwide spread of hemorrhagic colitis complicated by diarrhea-associated hemolytic uremic syndrome (D+HUS), a disorder of thrombocytopenia, microangiopathic hemolytic anemia, and acute renal failure that mainly affects infants and small children (1–3). Death or end-stage renal disease occurs in ∼12% of patients with D+HUS, and 25% of survivors demonstrate long-term renal sequelae (4). Over the last two decades, E. coli O157:H7 has been the cause of multiple outbreaks, becoming a public health problem in both developed and developing countries (1, 5–7). Apart from supportive therapy, there are presently no specific treatments for D+HUS (8), and strategies including STEC-component vaccines, Stx receptor mimics, and Abs against Stx are still under investigation (9). After STEC ingestion, Stx is transported in the circulation to the capillary bed of target organs, including the kidney (5, 6). Glomerular endothelium that expresses the receptor globotriaosyl ceramide (Gb3)/CD77 (10, 11) is the main target of the toxic effects of Stx1 and 2 (12), which activate a cascade of signals contributing to vascular dysfunction, leukocyte recruitment, and thrombus formation (13–19). 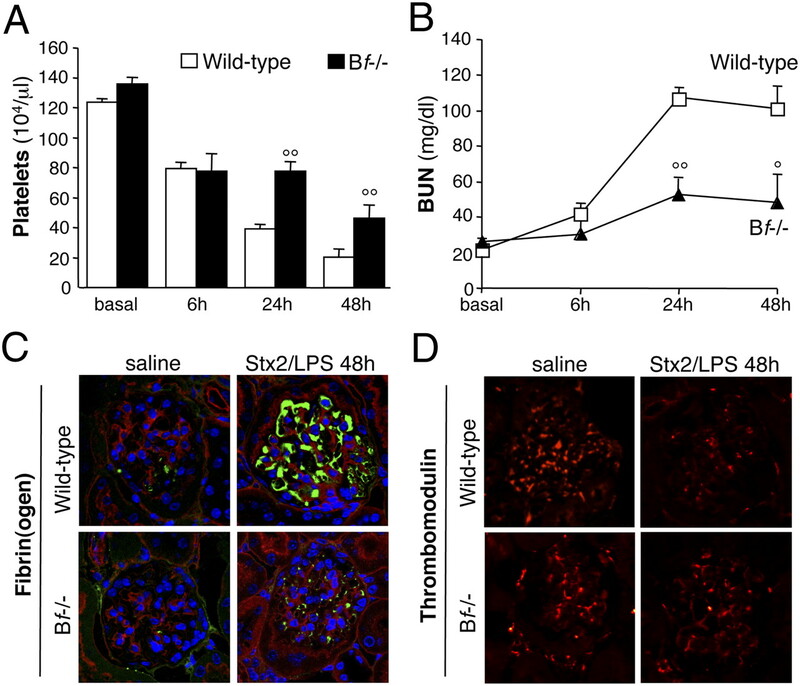 We previously reported that Stx promoted von Willebrand factor (VWF)-dependent thrombus growth on microvascular endothelium under flow via upregulation of P-selectin (17). In patients with D+HUS, elevated plasma levels of P-selectin were measured during the acute phase, which reflected increased P-selectin expression by activated endothelial cells and platelets (20). P-selectin overexpressed on activated platelets and transfected Chinese hamster ovary cells had the capacity to activate the complement (C) system by acting as C3b binding protein, thereby generating the anaphylatoxins C3a and C5a and the membrane attack complex (C5b-9) (21). C3a and C5a, through binding to G-protein coupled receptors, elicit inflammatory responses such as cytokine production, adhesive molecule expression, and increased vascular permeability, leading to endothelial cell activation (22–24). Whether C activation at renal endothelial level may contribute to microangiopathic lesions in D+HUS has never been addressed. There are anecdotes on reduced C3 and augmented C3b, C3c, and C3d serum levels in patients with active D+HUS (25–27). High plasma levels of Bb and C5b-9 were recently measured in 17 children with D+HUS, indicating C activation via alternative pathway during the onset of D+HUS (28). Another study reported that Stx2 activated C in the fluid phase in vitro (29). However, the use of huge amounts of Stx2, together with the observation of no active Stx in plasma of patients with D+HUS (30), raises concerns about the pathophysiologic meaning of these results. In this study, we investigated in vitro whether Stx activated C via the alternative pathway by promoting binding of C3 on microvascular endothelial P-selectin under flow conditions. The role of C in favoring thrombus formation on endothelial cells in response to Stx was evaluated. A novel mechanism by which C3a generated by Stx-induced C activation impaired endothelial thromboresistance was explored. To validate the in vitro findings, we assessed the causal role of glomerular P-selectin on C3 deposition in a mouse model of HUS obtained by coinjection of Stx2 and LPS. The involvement of C activation via the alternative pathway in the development of microvascular thrombosis was studied applying the HUS model to factor B-deficient (Bf−/−) mice. Finally, the contribution of C3a in the thrombogenic process induced by Stx was assessed by blocking C3a receptor in HUS mice. The human microvascular endothelial cell line of dermal origin (i.e., HMEC-1, from Dr. Edwin Ades and Francisco J. Candal [Centers for Disease Control and Prevention] and Dr. Thomas Lawley [Emory University]) (31) was cultured as described (17). Purified Stx1 (provided by Dr. Helge Karch and Dr. Martina Bielaszewska, Institute for Hygiene, University of Münster, Germany) (32) and commercially available Stx1 and Stx2 (Toxin Technology) were used. Human serum (HS) from a pool of four healthy volunteers was used as a source of C. To remove platelet microparticles, serum was filtered with a 0.22-μm filter (Millipore) before each experiment (33). Fifty percent of HS was chosen as the most appropriate nontoxic dose on the basis of preliminary experiments evaluating C3 deposits. To study the effect of Stxs on C3 accumulation and thrombus formation, HMEC-1 were treated with medium (control), purified Stx1, or commercially available Stx1 or Stx2 (50 picomolar [pM]) for 24 h in static conditions. Next, cells were perfused or not with 50% HS (3 min) followed or not followed by whole blood in a parallel plate flow chamber at a constant flow rate of 1500 s−1 (60 dynes/cm2) for 3 min (Supplemental Fig. 1). Soluble C receptor-1 (sCR-1; 100 μg/ml; CellDex) was incubated for 20 min with HS before perfusion on HMEC-1. To evaluate whether Stx-induced C activation occurred via the alternative pathway, HS was pretreated for 30 min with MgCl2-EGTA (5 mM; Sigma), an inhibitor of the classical pathway of C activation. P-selectin expression was examined in HMEC-1 incubated with purified Stx1 (24 h, static condition). Costaining of P-selectin and C3 was performed on Stx-treated HMEC-1 perfused with HS. Functional blocking anti-P-selectin Ab (25 μg/ml; R&D Systems) or the irrelevant anti-CD44 Ab (25 μg/ml; Abcam), which binds to the endothelial cell surface, were added for 20 min to HMEC-1 at the end of Stx challenge and to serum (Supplemental Fig. 1). P-selectin was also blocked by PSGL-1 (20 μg/ml; R&D System), the soluble ligand of P-selectin, added to both Stx-treated cells (20 min before perfusion) and serum. Involvement of C3a in thrombus formation on Stx-treated HMEC-1 was investigated by adding the C3aR antagonist SB290157 (1 μM; Calbiochem) to the cells before perfusion and to serum and blood (Supplemental Fig. 1). Endothelial expression of thrombomodulin (TM) and P-selectin was evaluated after incubation with purified C3a (1 μM, Calbiochem) in static condition. The serine protease inhibitor aprotinin (200 kallikrein inhibitor unit [KIU]/ml; Sigma) was added to medium alone or to C3a. TM expression on HMEC-1 was also investigated after 6 h exposure to tissue-plasminogen activator (t-PA; 10 μg/ml; Actyplase, Boehringer Ingeheim Pharma). HMEC-1 at the end of the perfusions were fixed in 3% paraformaldehyde and stained with the following Abs: FITC-conjugated anti-human C3c (11.3 μg/ml; Dako), anti-human C5b-9 (27.6 μg/ml; Calbiochem) followed by FITC-conjugated secondary Ab (13.6 μg/ml; Jackson Immunoresearch Laboratories), anti-human P-selectin (20 μg/ml, R&D Systems) followed by Cy3-conjugated secondary Ab (13.6 μg/ml; Jackson Immunoresearch Laboratories), and anti-human TM (1:50; R&D Systems) followed by Cy3-conjugated secondary Ab. Isotype-matched irrelevant Abs were used as a negative control. Coverslips were examined under confocal inverted laser microscopy (LSM 510 Meta; Zeiss, Jena, Germany). Fifteen fields per sample were acquired, and the area of staining was quantified (pixel2/field) using Image J software (National Institutes of Health, Bethesda, MD). For colocalization studies, samples were imaged by confocal microscopy using a z-scan (eight images acquired at 1.5-μm intervals by vertical projection). TM expression was measured by counting cells with moderate or strong intensity staining in 20 fields per sample. Data were expressed as a percentage of fluorescent cells per total cells in each field. Binding studies were performed using the ProteOn XPR36 Protein Interaction Array system (Bio-Rad Laboratories), based on surface plasmon resonance (SPR) technology. Purified human C3b (Complement Technology) was covalently immobilized onto one flow channel surface of a Proteon GLC sensor chip (Bio-Rad), using amine coupling chemistry. The amount of C3b covalently immobilized onto the surface, expressed in resonance units (RU; 1 RU = 1 pg protein/mm2), was ∼7500 RU. A reference channel, with no ligand immobilized, was always prepared in parallel. Different concentrations, ranging from 21 to 310 nM, of recombinant human soluble P-selectin (R&D System) were then injected simultaneously over immobilized C3b (or over the reference surface in parallel) at a rate of 30 μl/min for 2 min (association phase). The dissociation phase was evaluated in the following 10 min. The running buffer, also used to dilute analytes, was either phosphate-buffered saline pH 7.4, 0.005% Tween 20 (Bio-Rad) or Tris HCl (10 mM, pH 7.4 containing 150 mM NaCl, 1.2 mM CaCl2 and 1.2 mM MgCl2). All these assays were done at 25°C. Perfusion of heparinized whole blood (10 UI/ml) obtained from healthy subjects (prelabeled with the fluorescent dye mepacrine, 10 μM) was performed in a flow chamber (17). After 3 min of perfusion, the endothelial cell monolayer was fixed in acetone. Fifteen images per sample of platelet thrombi on endothelial cell surface were acquired by confocal inverted laser microscope, and areas occupied by thrombi were evaluated by using Image J software. Male C57BL/6 mice were obtained from Charles River Italia. Bf−/− mice of C57BL/6 genetic background (34) and C57BL/6 wild type mice were a gift from Dr. Marina Botto (Imperial College, London). For this study, Bf−/− mice and control wild type littermates were obtained by heterozygote × heterozygote matings at the Mario Negri Institute. Genotypes were determined by PCR (34). Animal care and treatment were performed in accordance with institutional guidelines in compliance with national and international laws and policies. Animal studies were approved by the institutional animal care and use committees of the Mario Negri Institute (Milan, Italy). HUS was induced in mice (26–28 g body weight) by i.p. injection of Stx2 (200 ng; Toxin Technology) plus LPS (75 μg, O111:B4, Sigma). Mice injected with saline served as controls. In parallel, some mice were injected with Stx2 or LPS alone. Stx2 was chosen because it is associated with HUS clinical isolates more often than Stx1 (6) and because of the evidence that Stx2 injected in mice is more toxic and accumulates in the kidney to a greater extent than Stx1 (35). The dosing protocol was based on previous studies (16, 36). Mice were sacrificed at 3, 6, 24, or 48 h after injection. Blood platelet count and renal function measured by serum blood urea nitrogen (BUN; Reflotron test, Roche Diagnostics) were assessed. In separate experiments, C57BL/6 mice were given a 50-μg dose i.v. of a function-blocking anti-mouse P-selectin Ab RB40.34 or an isotype-matched control Ab A110.1 (BD Pharmingen), 1 h before Stx2/LPS. A second dose was administered 6 h later; mice were sacrificed 24 h after Stx2/LPS. The dose of RB40.34 was chosen on the basis of previous studies (37). Other experiments included treatment of mice with the C3aR antagonist SB290157 (15 mg/kg i.p.) or an equal volume of vehicle (saline and dimethyl sulfoxide) four times per day (1 h before and 1, 4, and 8 h after Stx2/LPS injection). Fragments of kidney tissue were processed as described (16). Ultrathin sections were stained with uranyl acetate and lead citrate and were examined using a transmission electron microscope (Morgagni 268D; Philips, Brno, Czech Republic). Periodate lysine paraformaldehyde (PLP)-fixed frozen sections (3 μm) were incubated with FITC-conjugated goat anti-rat fibrin(ogen) Ab (1:40; Nordic Immunology) and with rhodamine WGA lectin (Vector Laboratories) dissolved in DAPI. Fibrin(ogen) deposition in glomerular capillary walls was assessed by confocal microscopy and scored from 0 to 3 (0, absent or trace; 1, weak granular, discontinuous staining; 2, strongly staining; 3, occasional obliteration). P-selectin expression was evaluated in frozen sections incubated with anti-mouse P-selectin Ab (3 μg/ml; BD Pharmingen) or with isotype-matched irrelevant Ab, followed by FITC-conjugated secondary Ab (1:150; Sigma-Aldrich). To determine the location of P-selectin in the glomerulus, adjacent sections were incubated with rabbit anti-VWF (1:100; Dako) followed by Cy3-conjugated anti-rabbit Abs (60 μg/ml; Jackson Immunoresearch Laboratories). Negative controls were obtained with secondary Ab alone. C3 deposits were evaluated by staining with FITC-conjugated anti-mouse C3 Ab (10 μg/ml; Cappel). For C9 staining, rabbit anti-rat C9 (1:200; a gift from Paul Morgan, Cardiff, U.K.) and Cy3-conjugated secondary Abs (30 μg/ml; Jackson Immunoresearch Laboratories) were used. Isotype-matched irrelevant Abs were used as negative controls. Glomerular C3 and C9 staining was scored from 0 to 3 (0, no staining or traces [<5%]; 1, staining in <25% of the glomerular tuft; 2, staining affecting 26 to 50%; 3, staining in >50%). TM was detected in PLP-fixed sections using rabbit anti-TM Ab (1:25; Santa Cruz) followed by Cy3-conjugated goat anti-rabbit IgG (15μg/ml; Jackson Immunoresearch Laboratories). Glomerular TM expression was estimated using Image J software. Results are expressed as means ± SEM. Data were analyzed by the nonparametric Mann–Whitney or Kruskal–Wallis tests, or by ANOVA as appropriate. The p values <0.05 were considered statistically significant. To test whether C activation by Stxs involves C3 activation and deposition, we evaluated C3 deposition on endothelial cell surface in response to the toxin. HMEC-1 were incubated with purified Stx1 (50 pM, 24 h) and then perfused in a parallel plate flow chamber (60 dynes/cm2, 3 min) with 50% HS as a source of C (Supplemental Fig. 1). Under these conditions, monolayer integrity was preserved (Supplemental Fig. 2A). A marked increase of C3 deposits on Stx1-treated cells was observed with respect to unstimulated cells (Fig. 1A, 1B), indicating that endothelial cells activated by Stx fixed C. Similar results were obtained using nonpurified, commercially available Stx1 and Stx2 (Supplemental Fig. 2B). No C5b-9 deposits were detected on Stx-treated HMEC-1 after the short HS perfusion (not shown). Stx1 induces C3 activation and deposition on HMEC-1 via endothelial P-selectin. A, Images of C3 deposition on HMEC-1 exposed or not to Stx1 (24 h) and then perfused at high-shear stress with 50% HS for 3 min. C deposition is inhibited by pretreating HS with sCR-1 or with MgCl2-EGTA before perfusion (original magnification ×200). B, Quantification of C3 deposits. Values (mean ± SEM) are expressed as fold increase versus control + HS = 1 (n = 6 experiments). C, C3 (green) colocalizes with P-selectin (red) resulting in yellow overlap (merge) on HMEC-1 incubated with Stx1 and then perfused with HS. Nuclei are stained with DAPI (blue). D, High-affinity binding of soluble P-selectin (s P-sel) to C3b by SPR. The left and middle panels show the sensorgrams of two independent sensors (time course of the SPR signal in RU) obtained by simultaneously injecting three concentrations of soluble P-selectin [P-sel] over sensor surfaces immobilizing C3b. The right panel shows the saturation isotherm. E, C3 deposition on Stx-treated HMEC-1 perfused with HS is reduced by anti–P-selectin (anti-Psel) Ab or PSGL-1. An Ab recognizing cell surface Ag (CD44) is used as irrelevant (irrel). Values (mean ± SEM) are expressed as fold increase versus control + HS = 1 (n = 4 experiments). °p < 0.01 versus control + HS, #p < 0.01 versus Stx1 + irrel Ab + HS, *p < 0.01 versus Stx1 + HS. When HS was incubated with the sCR-1—an inhibitor of classical, alternative, and lectin pathways of C activation—endothelial C3 deposits induced by Stx1 were abolished, indicating specificity of the C3 signal (Fig. 1A, 1B). The role of the alternative pathway of C activation was documented by the finding that C3 deposition induced by Stx1 was not modified by inhibiting the classical pathway with MgCl2-EGTA added to HS before cell perfusion (Fig. 1A, 1B). Because we showed previously that Stx1 induced endothelial expression of P-selectin (17), an adhesive protein that also acts as a C3b receptor on platelets and Chinese hamster ovary cells (21), experiments were performed to evaluate whether P-selectin had a role in C activation and C3 deposition on Stx-activated endothelial cells. First, we documented by immunofluorescence the increase of P-selectin as a granular pattern on the endothelial apical side after exposure to purified Stx1 (Supplemental Fig. 3A). We then evaluated whether P-selectin could interact with C3 on HMEC-1 exposed to Stx and perfused with HS. By confocal microscopy, the majority of C3 deposits colocalized with P-selectin (Fig. 1C). Such a colocalization was visible in a large number of Stx-treated endothelial cells. Moreover, binding studies with SPR showed a specific interaction between C3b and P-selectin. Fig. 1D (left and middle panels) shows the sensorgrams (time-course of SPR signal) obtained when flowing different concentrations of soluble P-selectin over C3b immobilized on the sensor chip. A dose-dependent binding signal was detected. A clearly biphasic dissociation curve did not fit the simplest 1:1 interaction. The interaction is more complex, suggesting a conformational change in C3b molecules once bound to P-selectin, or the presence of cooperativity among the multiple binding sites (SCR domains) present on P-selectin, as previously described for binding of C3b to CR1 (38, 39). However, the plot of the equilibrium responses could be fitted by a simple saturation isotherm, allowing the estimation of a Kd value of 77 ± 28 nM (Fig. 1D, right panel). Next, we documented that P-selectin mediated C3 binding on the surface of Stx-treated HMEC-1. Cell exposure to functional blocking anti–P-selectin Ab, before and during HS perfusion, led to a significant inhibition of C3 deposits in response to Stx1 (Fig. 1E), whereas the addition of irrelevant Ab had no effect. Moreover, a strong decrease of C3 accumulation was observed when PSGL-1, the soluble ligand of P-selectin, was added to HMEC-1 before and during HS perfusion (Fig. 1E). To establish whether C activation and deposition on HMEC-1 could be instrumental to thrombus formation, Stx1-treated cells were exposed to a double perfusion consisting of HS, followed by whole human blood prelabeled with the fluorescent dye mepacrine, or to a single perfusion with blood alone (Supplemental Fig. 1). When Stx-1–treated cells were perfused with HS and blood, a more intense deposition of C3 and increased endothelial surface area covered by thrombi were detected, as compared with unstimulated cells (Table I). Notably, after double perfusion, C3 deposits were followed by thrombi detected on the endothelial surface to a significantly greater extent than on Stx-treated cells subjected to single blood perfusion (Table I). A representative image of organized thrombi formed on the endothelial cell monolayer is shown in Supplemental Fig. 3B. Pretreatment of HS and blood with sCR-1 significantly (p < 0.01) limited platelet thrombi on HMEC-1 exposed to the toxin, indicating a causal link between C3 deposition and thrombus formation (Fig. 2A, 2B). C3 bound to P-selectin favors thrombus formation on endothelial cells in response to Stx. A, Representative images of fluorescent thrombi on control or Stx1-treated HMEC-1 perfused with HS and blood pretreated or not with sCR-1 before perfusion. Stx-treated HMEC-1 are also exposed to irrelevant (irrel) or anti-Psel Abs before double perfusion (original magnification ×200). B, Quantification of fluorescent thrombi (mean ± SEM) expressed as pixel2 × 103 (n = 6 experiments). °p < 0.01 versus control + HS, *p < 0.01 versus Stx1 + HS, #p < 0.01 versus Stx1 + irrel Ab + HS. 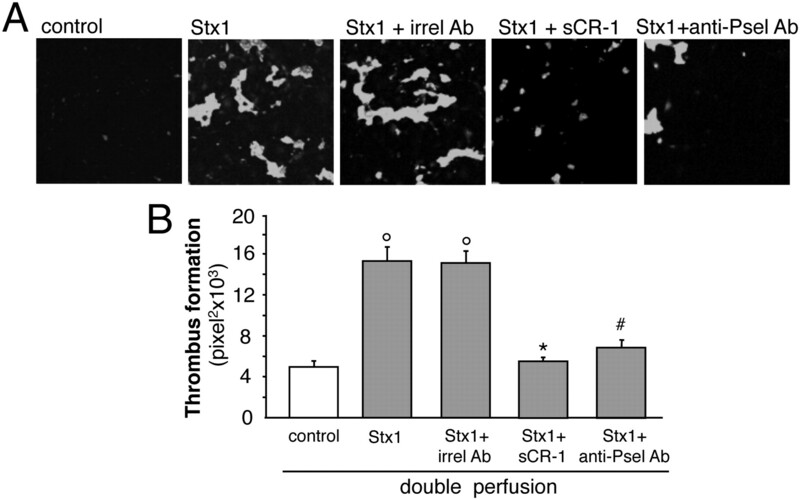 We next examined whether P-selectin blockade could limit C-dependent thrombus formation on endothelial cells in response to Stx. P-selectin inhibition in Stx1-treated cells exposed to double perfusion of HS and blood resulted in decreased C3 accumulation (Supplemental Fig. 3C), followed by a significant reduction in platelet thrombi (Fig. 2A, 2B). Irrelevant Ab had no effect on Stx-induced C3 deposition (Supplemental Fig. 3C) and thrombus formation (Fig. 2A, 2B). These data indicate that endothelial P-selectin upregulated by Stx is instrumental for C activation and C3-dependent thrombus formation on microvascular endothelium. To discover how C activation triggers thrombus formation on endothelial cells, we studied the effect of the anaphylatoxin C3a—a breakdown product generated during C activation and C3 deposition—on endothelial thromboresistance properties. We focused on TM, a glycoprotein highly expressed on endothelial cell surface, with cytoprotective and antithrombotic effects (40). TM was constitutively expressed on HMEC-1 (percentage of fluorescent cells with moderate and strong intensity: 54.2 ± 4.3 and 6.7 ± 1.1%). Treatment with Stx1 alone slightly reduced TM expression, which further decreased after HS perfusion (Fig. 3A, Supplemental Fig. 3D). Addition of the C3aR antagonist SB290157 on Stx-treated HMEC-1 perfused with HS prevented TM loss (Fig. 3A, Supplemental Fig. 3D). Providing further evidence for a role of this anaphylatoxin, we found a marked reduction of TM expression on the surface of HMEC-1 exposed to exogenous purified C3a (Fig. 3B). Because the cleavage of TM is thought to be dependent by serine protease activity, we examined t-PA, a serine protease present in endothelial Weibel-Palade bodies possibly released upon C3a stimulation (41). Blockade of t-PA activity by treatment of HMEC-1 with the serine protease inhibitor aprotinin prevented TM shedding in response to exogenous C3a (Fig. 3B). Aprotinin alone as a control did not affect the constitutive expression of TM (percentage of fluorescent cells with moderate and strong intensity: aprotinin, 67.7 ± 5.3 and 7.6 ± 0.6 versus control, 62.4 ± 4.9 and 8.3 ± 0.7). Consistently, the addition of t-PA to HMEC-1 significantly (p < 0.01) reduced TM expression on the cell surface (percentage of fluorescent cells with moderate and strong intensity: t-PA, 51.3 ± 2.1 and 1.7 ± 0.3 versus control, 62.2 ± 1.2 and 6.6 ± 0.9). The finding that C3a may favor exocytosis of the Weibel-Palade body’s content was also supported by the increased apical staining of P-selectin on C3a-treated HMEC-1 (Fig. 3C). The effects induced by C3a were critical for thrombus formation, as evidenced by the significant (p < 0.01) reduction of platelet thrombi on Stx-treated HMEC-1 perfused with HS and blood in the presence of the C3aR antagonist (Fig. 3D). 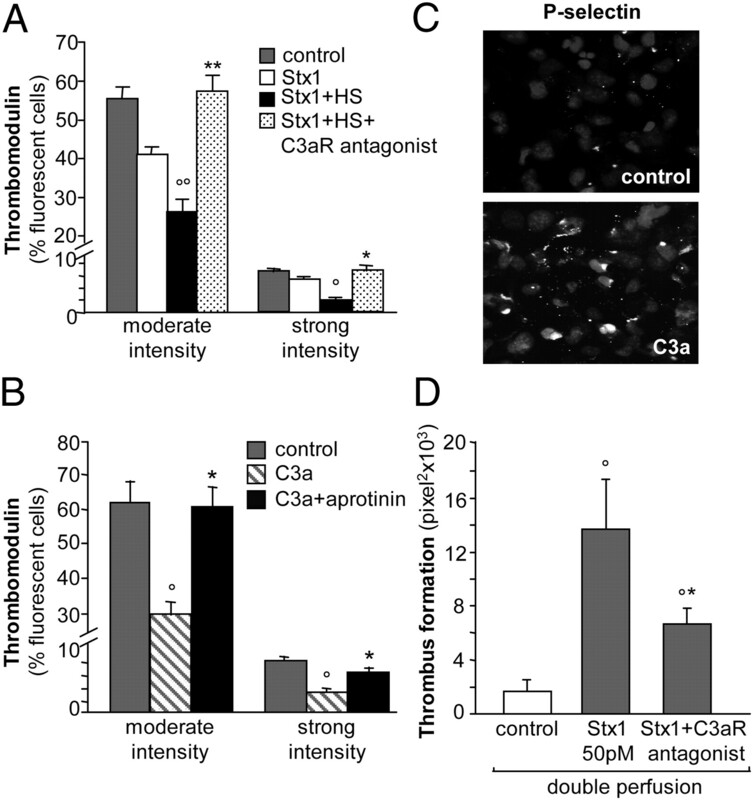 C3a generated by Stx-induced C activation impairs the endothelial antithrombogenic properties. A, TM expression on HMEC-1 exposed to control medium or Stx1 (24 h) and then perfused with medium or 50% HS. Addition of the C3aR antagonist (SB290157) prevents TM loss in response to Stx1 on HMEC-1 surface. Values (mean ± SEM) are expressed as percentage of fluorescent cells per total cells in each field (n = 5 experiments). °p < 0.05, °°p < 0.01 versus corresponding control; *p < 0.05, **p < 0.01 versus corresponding Stx1 + HS. B, TM expression on HMEC-1 decreases upon incubation with purified C3a (6 h). Treatment of HMEC-1 with aprotinin (200 KIU/ml) prevents TM loss in response to C3a. Values (mean ± SEM) are expressed as a percentage of fluorescent cells per total cells in each field (n = 5 experiments). °p < 0.01 versus corresponding control; *p < 0.01 versus corresponding C3a. C, Representative images showing that C3a (3 h) increases P-selectin expression on HMEC-1 surface with respect to unstimulated cells. Nuclei are stained with DAPI (original magnification ×200). D, Thrombus formation on HMEC-1 treated with Stx-1 and then perfused with whole blood is markedly decreased by a C3aR antagonist. Area covered by thrombi is expressed as pixel2 × 103 (n = 4 experiments). °p < 0.01 versus control, *p < 0.01 versus Stx1. We have recently (16) established a murine model of HUS induced by coinjection of Stx2 and LPS on the basis of the evidence that two virulence factors of enterohemorrhagic E. coli, Stx and LPS, are required to induce cardinal signs of clinical HUS in mice (42). C57BL/6 mice treated with Stx2/LPS showed a dramatic decrease of the blood platelet count during time relative to the baseline (Fig. 4A). Renal function was severely impaired, as indicated by high serum BUN levels (Fig. 4B). Kidneys from Stx2/LPS-treated mice showed, over time, abundant fibrin(ogen) deposition in the glomerular capillary loops (Fig. 4C), as compared with controls given saline (score: saline, 0.17 ± 0.07 and Stx2/LPS, 6 h 0.17 ± 0.03, 24 h 1.48 ± 0.16, 48 h 2.08 ± 0.06; p < 0.01 Stx2/LPS 24 and 48 h versus saline). Glomerular expression of TM was reduced by 31.1 ± 4.3% in Stx2/LPS-treated mice compared with control mice at 24 h (p < 0.01). These data are consistent with the presence of intracapillary glomerular platelet clumps as revealed by transmission electron microscopy (Fig. 4D). Other ultrastructural changes included focal endothelial swelling and polymorphonuclear cell infiltrates. C57BL/6 mice treated with Stx2/LPS develop thrombocytopenia, renal failure, and glomerular thrombosis. A, Platelet count decreases during time in mice coinjected i.p. with Stx2 and LPS (n = 7 mice at each time point). Data are presented as mean ± SEM. B, These mice exhibit elevated BUN levels. °p < 0.01 versus basal. C, Fibrin(ogen) deposits (green) increase during time in the glomeruli of mice treated with Stx2/LPS. Nuclei and cell membranes are counteracted with DAPI (blue) and rhodamine WGA-lectin (red), respectively (original magnification ×630). D, Representative electron micrographs of glomeruli from mice given saline (control) or Stx2/LPS. Platelet (P) clumps in the capillary loops, focal endothelial swelling (arrow), marked infiltration of polymorphonuclear cells (PMN) and rare monocytes (M) are evident in Stx2/LPS-treated mice 24 h after injection (original magnification ×14,000 and ×3500). In animals injected with Stx2 alone, platelet count remained within the normal range, whereas it decreased after LPS (16) (Supplemental Fig. 4A), in accordance with the expression of TLR4 on platelets (43). Each agent caused slight increases in BUN (Supplemental Fig. 4B), mild glomerular endothelial swelling, and low polymorphonuclear cell accumulation (data not shown). Next, we evaluated the expression of P-selectin in glomeruli of Stx2/LPS-treated mice. Positive staining for P-selectin was observed in glomerular endothelial cells at 3 (Fig. 5A) and 6 h (not shown) after Stx2/LPS injection. The endothelial localization of P-selectin was documented by evidence of labeling of the endothelial marker VWF on the same cells in serial sections (Fig. 5A). No P-selectin staining was present in the glomeruli of controls (Fig. 5A) or after treatment with LPS alone (data not shown). Excessive glomerular C3 (Fig. 5B) and C9 (Supplemental Fig. 4D) deposits followed P-selectin upregulation, with an irregular distribution along the glomerular capillary wall, starting 6 h after Stx2/LPS. In the kidneys of control mice, C3 staining was confined to a linear reactivity along the Bowman’s capsule (44, 45). In the glomeruli of mice treated with LPS alone, C3 deposits were absent or minimal (Supplemental Fig. 4C). The role of P-selectin in favoring glomerular C deposits in response to Stx2/LPS was documented by finding that treatment with blocking P-selectin Ab effectively limited C3 deposits compared to mice given the irrelevant Ab (Fig. 5C). Glomerular endothelial expression of P-selectin causes C3 deposits in C57BL/6 mice treated with Stx2/LPS. A, Staining of P-selectin in glomeruli of mice injected with saline (control) or Stx2/LPS at 3 h. VWF staining in an adjacent renal section of Stx2/LPS-treated mouse reflects localization of P-selectin in glomerular endothelial cells (arrow). Original magnification ×630. B, Glomerular C3 staining increases 6 h after Stx2/LPS treatment with respect to saline (control) as assessed by semiquantitative score. Data are mean ± SEM (n = 7 mice for each time point). Original magnification ×630. C, P-selectin blockade limits glomerular C3 deposits in C57BL/6 HUS mice. Mice are injected with the anti-P-selectin (anti-Psel) or irrelevant (irrel) Abs and sacrificed after 24 h (n = 5 mice for group). Control mice receive saline (n = 5). Data are mean ± SEM. °p < 0.05, °°p < 0.01 versus control, *p < 0.05 versus irrel Ab. To establish the involvement of C activation in the microvascular thrombotic process, we used mice deficient for factor B, a zymogen that carries the catalytic site of the alternative pathway C3 and C5 convertases (46). After Stx2/LPS treatment, Bf−/− mice exhibited less thrombocytopenia and were protected against renal function impairment compared with wild type littermate mice (Fig. 6A, 6B). The blockade of the alternative pathway of C activation also resulted in fewer fibrin(ogen) deposits (Fig. 6C; 48 h, score: saline, Bf−/− 0.19 ± 0.04 versus wild type 0.22 ± 0.06; Stx2/LPS, Bf−/− 0.70 ± 0.23 versus wild type 2.15 ± 0.09; p < 0.01). 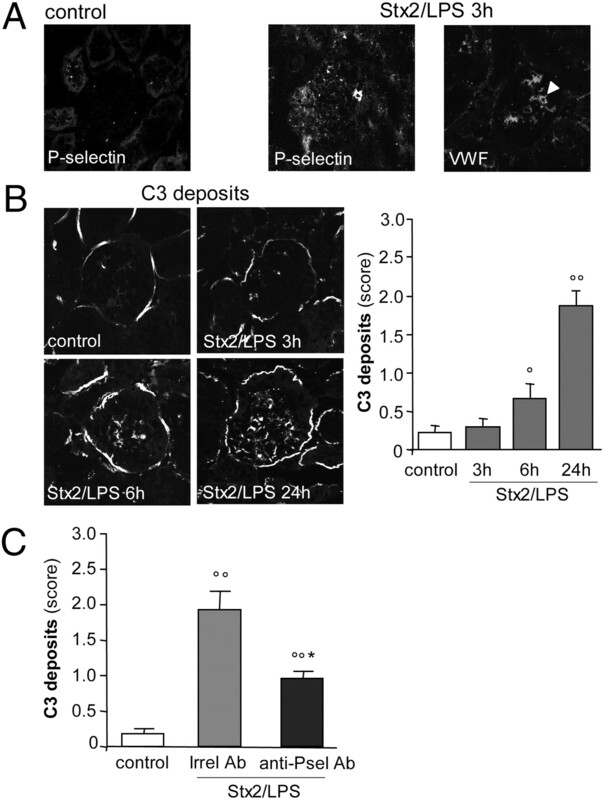 No C3 deposits or platelet clumps were found in the glomeruli of Stx2/LPS-treated Bf−/− mice. Moreover, while glomerular TM expression was reduced by 42.8 ± 7.3% at 48 h in wild type mice given Stx2/LPS compared with saline-treated control mice (Fig. 6D), no changes were observed in Bf−/− mice regarding corresponding controls (Fig. 6D), thereby suggesting the causal role of C activation in the loss of thromboresistance. Activation of C, via the alternative pathway, favors C3a-dependent glomerular prothrombotic state in mice with HUS. A, In Bf−/− mice the fall in platelet count after Stx2/LPS treatment is significantly less than in wild type littermates. B, Bf−/− mice are protected from renal function impairment, assessed as serum BUN, with respect to wild type after Stx2/LPS (n = 6–10 mice per group). Data are mean ± SEM. °p < 0.05, °°p < 0.01 versus wild type. C, Few glomerular fibrin(ogen) deposits in Bf−/− mice given Stx2/LPS are present versus wild type mice exhibiting abundant fibrin(ogen) staining (green). Nuclei are stained with DAPI (blue), and cell membranes are stained with rhodamine WGA-lectin (red; original magnification ×630). D, Representative images of TM expression in glomeruli of wild type and Bf−/− mice evaluated 48 h after saline or Stx2/LPS injection. TM expression decreases in wild type but not in Bf−/− mice after Stx2/LPS injection (original magnification ×630). The contribution of C3a in the thrombogenic process induced by Stx was evaluated by blocking C3aR in HUS mice. Administration of a C3aR antagonist to Stx2/LPS-treated C57BL/6 mice significantly (p < 0.05) limited glomerular fibrin(ogen) deposition and platelet clumps (not shown) compared to mice receiving vehicle (Fig. 7A). In this study, we also assessed TM expression and found that C3aR antagonist limited (p < 0.01) glomerular TM loss after Stx2/LPS (Fig 7B). A scheme of the mechanisms suggested by the present data is shown in Fig. 8. C3a contributes to the thrombogenic process in mice with HUS. A, C3aR blockade limits fibrin(ogen) deposition in the glomeruli of C57BL/6 HUS mice. Mice are treated with C3aR antagonist (SB290157) or with vehicle (n = 4 mice per group), and sacrificed after 24 h. Control mice receive saline (n = 4). Fibrin(ogen) deposits are assessed by semiquantitative score. Data are mean ± SEM. B, Loss of glomerular TM expression after Stx2/LPS injection is limited by treatment with a C3aR antagonist. Data are mean ± SEM of n = 4 mice per group. °°p < 0.01 versus control, *p < 0.05, **p < 0.01 versus vehicle. Stx alters endothelial thromboresistance by triggering exuberant C activation via C3a, leading to microvascular thrombosis. The proposed scheme summarizes the sequence of events through which Stx binds to its specific endothelial receptor Gb3 and favors surface mobilization of P-selectin and thrombus formation under flow by either interacting with platelets or by binding and/or activating C proteins. Excessive C3 activation (dependent on increased C3 convertase assembly and activity) in response to Stx generates an increased amount of the anaphylatoxin C3a, which interacts with the specific endothelial C3aR, thereby potentiating P-selectin expression and t-PA-dependent TM shedding with final thrombus formation. To our knowledge, this study is the first to demonstrate by multifaceted approaches that Stx triggers microvascular thrombosis via the alternative pathway of C activation and indicates C3a as the key factor in the development of the thrombotic processes in HUS. Previous findings of low serum C3 levels (25, 27) and augmented breakdown C products (27, 28) suggested the involvement of C in D+HUS, although the functional relevance of these abnormalities to the thrombotic process was not addressed. Our data provide evidence that Stx1 promotes C3 activation and deposition on microvascular endothelial cells via the alternative pathway, because no inhibition was found by blocking the classical pathway. A relevant observation is that C3 deposition favors thrombus growth under flow on the surface of Stx-treated HMEC-1, which is prevented by the C inhibitor sCR-1. This mechanism applies also in vivo, because Bf−/− mice with impaired C activation via the alternative pathway were protected from renal prothrombotic processes when injected with Stx2/LPS compared to wild-type mice that showed intraglomerular C3 and fibrin(ogen) deposition, TM loss, and platelet clumps associated with severe thrombocytopenia. In the search for mechanisms underlying C activation elicited by Stx and ultimately leading to thrombus formation, we have identified P-selectin as an endothelial binding site for C3. As shown previously (17) and documented in this study, upon challenge with Stx the microvascular endothelium expresses P-selectin, an adhesive molecule implicated in VWF-dependent platelet deposition (47). Rather than simply a marker of endothelial activation, P-selectin acts as a specific ligand for C3 through high-affinity binding, based on the evidence that it colocalizes with the majority of C3 deposits on Stx-treated HMEC-1. P-selectin is crucial in C-dependent thrombus formation because functional blocking of P-selectin leads to a marked reduction of C3 accumulation and limits thrombus extension on Stx-treated endothelial cells. The processes by which P-selectin favors C activation on endothelial cells are still poorly defined. It is possible that C3b bound to P-selectin may undergo conformational changes that either prevent its inactivation by C regulatory molecules or favor C3b interaction with factor B, thus leading to assembly of alternative pathway C3 convertase. We have also provided a novel mechanism through which activated C proteins foster thrombosis on Stx-activated endothelium. In our experimental setting, Stxs promoted C3 activation and deposition that resulted in C3a generation; therefore, we focused on the endothelial effect of this anaphylatoxin. C3a powerfully increased P-selectin expression and reduced TM on the HMEC-1 surface, indicating a major role for C3a as a driving factor in altering endothelial thromboresistance. The proof of this concept rests on data showing that TM loss and thrombus growth on Stx-treated endothelium were markedly reduced by C3aR antagonist. However, we cannot exclude a contribution of C5a in the prothrombotic effects triggered by Stx, considering that C5a shares with C3a various inflammatory activities on endothelial cells (22–24). It is known that TM, a cofactor of thrombin in the activation of protein C, regulates hemostasis and prevents local fibrin formation (40, 48, 49). Other properties of TM include anti-inflammatory and cytoprotective activities (40). It is therefore conceivable that shedding of TM from the endothelial surface can contribute to an increased risk of thrombosis associated with inflammation. In this regard, increased levels of soluble TM have been detected in the plasma of patients with disseminated intravascular coagulation syndrome, pulmonary thromboembolism, and chronic renal disorders (50). Little is known about the mechanisms underlying TM shedding and the proteases involved in its cleavage. Serine proteases were reported to be implicated in thiol-induced proteolytic cleavage of TM in association with damage of endothelial cell membrane (51, 52). Based on the evidence that t-PA is the serine protease stored in Weibel-Palade bodies of endothelial cells, we show that the inhibition of t-PA by aprotinin markedly limited C3a-dependent TM loss on microvascular endothelial cells. This finding was also supported by the direct effect of exogenously added t-PA on TM shedding in HMEC-1. Our findings shed light on the nexus among endothelium, C, and thrombosis, considering that previous knowledge of the prothrombotic effect of C was restricted to studies on platelets (53). Proteins of the C system, including C3, C5, C6, C7, C8, and C9, significantly enhanced thrombin-induced aggregation and secretion in human platelets. Furthermore, the anaphylatoxin C3a was shown to directly induce aggregation of human platelets and release of serotonin (53). That the mechanisms of thrombosis may be related to C activation has been also suggested by studies in patients with familial or sporadic forms of atypical HUS or paroxysmal nocturnal hemoglobinuria, both characterized by deficiency in C-regulatory molecules, platelet hyperactivity, and thrombosis (33, 54). The mechanisms proposed in vitro have been validated in a murine model of Stx-associated HUS, which closely mimics human D+HUS. The development of a mouse model able to reproduce the features of human HUS has been problematic, and studies using E. coli O157:H7, purified Stx1 or Stx2 with or without LPS (16, 35, 36, 42, 55, 56), have given controversial results. The role of E. coli LPS has been recognized in the molecular pathogenesis of D+HUS, based on the evidence of serum Abs against O157 LPS in children with D+HUS (57). In a baboon model of HUS, LPS increased the toxicity of Stx (58). Consistently, both Stx2 and LPS were required to elicit a HUS-like response in mice (16, 36, 42). Our experiments document that in mice treated with Stx2/LPS that developed thrombocytopenia and renal failure, enhanced P-selectin expression on glomerular endothelial cells preceded C3 deposits. Accumulation of C3 was associated with fibrin(ogen) deposits, platelet clumps, and TM loss. P-selectin blockade limited glomerular C3 deposits, which argues in favor of a causal relationship between endothelial P-selectin and C deposition. By means of Bf−/− mice that were protected against glomerular alterations and renal function impairment in response to Stx2/LPS, we showed that C activation via the alternative pathway was instrumental to microvascular thrombosis in HUS mice. This study also highlights the critical role of C3a, derived from glomerular C activation, in potentiating glomerular thrombotic processes. This finding is supported by data showing that treatment with a C3aR antagonist markedly reduced fibrin(ogen) and platelet accumulation and limited the loss of TM in the glomeruli of HUS mice. As suggested earlier (59), our results corroborate concepts that may prove of general significance in the understanding of the causes that trigger thrombosis and vascular occlusions. We previously explored the heterogeneity of endothelial cells based on the variable expression of specific molecules that determined a distinct response to stimuli (17) and demonstrated the link between infections and thrombosis. In this study, we elaborated on those concepts by documenting in a specific setting a phenomenon of interaction between C3 and P-selectin leading to the formation of C3a, which appears to be instrumental in microvascular thrombosis, and may have wider implications for acute occlusive vascular accidents in a broader sense. In conclusion, as summarized in Fig. 8, we have demonstrated by in vitro and in vivo experiments that Stx, by activating microvascular endothelial cells to express P-selectin, allows C3 deposition through the alternative pathway, favoring thrombus formation. Moreover, we have identified C3a, generated by Stx-induced C activation, as the key factor responsible for further expression of P-selectin, TM loss, and thrombus formation. These findings serve to suggest C inhibitors as possible therapeutic tools in the control of D+HUS. In particular, C3aR antagonists, currently available in preclinical studies (60) could represent a promising strategy. Currently, C inhibitors that have entered clinical studies were restricted to anti-C5 Abs that showed beneficial effects in paroxysmal nocturnal hemoglobinuria (61), myocardial infarction (62), and atypical non–Stx-associated HUS (63, 64). We thank Dr. A. Benigni for helpful suggestions and criticism, D. Corna and C. Zanchi for technical assistance, Dr. E. Ades and Dr. F.J. Candal (Centers for Disease Control and Prevention, Atlanta, GA) and Dr. T. Lawley (Emory University) for developing developed HMEC-1, Dr. H. Karch and Dr. M. Bielaszewska (Institute for Hygiene, University of Münster, Germany) for providing purified Stx1, Dr. M. Botto (Imperial College, London, U.K.) for the gift of the Bf−/− mice, and CellDex (Needham, MA) for providing sCR-1. This work was supported in part by a Genzyme Renal Innovation Program grant. M.L. is the recipient of a fellowship from Fondazione Aiuti per la Ricerca sulle Malattie Rare, Bergamo, Italy.
. 2005. Shiga-toxin-producing Escherichia coli and haemolytic uraemic syndrome. Lancet 365: 1073–1086.
. 2008. Treatment and outcome of Shiga-toxin-associated hemolytic uremic syndrome (HUS). Pediatr. Nephrol. 23: 1749–1760.
. 2005. Hemolytic uremic syndrome. J. Am. Soc. Nephrol. 16: 1035–1050.
. 2003. Long-term renal prognosis of diarrhea-associated hemolytic uremic syndrome: a systematic review, meta-analysis, and meta-regression. JAMA 290: 1360–1370. 2004. Infection by Shiga toxin-producing Escherichia coli: an overview. Mol. Biotechnol. 26: 117–122. 2008. Enterohaemorrhagic Escherichia coli and Shigella dysenteriae type 1-induced haemolytic uraemic syndrome. Pediatr. Nephrol. 23: 1425–1431.
. 2008. Variation in virulence among clades of Escherichia coli O157:H7 associated with disease outbreaks. Proc. Natl. Acad. Sci. USA 105: 4868–4873.
. 2009. Interventions for hemolytic uremic syndrome and thrombotic thrombocytopenic purpura: a systematic review of randomized controlled trials. Am. J. Kidney Dis. 53: 259–272. 2009. Treatment options for HUS secondary to Escherichia coli O157:H7. Kidney Int. Suppl. 75: S62–S66.
. 1989. Verotoxin receptor glycolipid in human renal tissue. Nephron 51: 207–210.
. 2001. Effect of Shiga toxin and Shiga-like toxins on eukaryotic cells. Microbes Infect. 3: 493–507.
. 1993. Endothelial heterogeneity in Shiga toxin receptors and responses. J. Biol. Chem. 268: 15484–15488.
. 1995. Verotoxin-1 promotes leukocyte adhesion to cultured endothelial cells under physiologic flow conditions. Blood 86: 4553–4558.
. 1989. Neutrophil-mediated endothelial injury in haemolytic uraemic syndrome. Lancet 2: 411–414.
. 2002. Shiga toxin-2 triggers endothelial leukocyte adhesion and transmigration via NF-kappaB dependent up-regulation of IL-8 and MCP-1. Kidney Int. 62: 846–856.
. 2008. Fractalkine and CX3CR1 mediate leukocyte capture by endothelium in response to Shiga toxin. J. Immunol. 181: 1460–1469.
. 2001. Verotoxin-1-induced up-regulation of adhesive molecules renders microvascular endothelial cells thrombogenic at high shear stress. Blood 98: 1828–1835.
. 2005. Shiga toxin 2 and lipopolysaccharide induce human microvascular endothelial cells to release chemokines and factors that stimulate platelet function. Infect. Immun. 73: 8306–8316.
. 2010. Shiga toxin-associated hemolytic uremic syndrome: pathophysiology of endothelial dysfunction. Pediatr. Nephrol. 25: 2231–2240.
. 1999. Plasma P-selectin in children with hemolytic uremic syndrome caused by Escherichia coli O157:H7. J. Nara Med. Assoc. 50: 515–523.
. 2005. Platelet activation leads to activation and propagation of the complement system. J. Exp. Med. 201: 871–879.
. 2003. Regulation by complement C3a and C5a anaphylatoxins of cytokine production in human umbilical vein endothelial cells. FASEB J. 17: 1003–1014.
. 2002. Complement c3a and c5a induce different signal transduction cascades in endothelial cells. J. Immunol. 169: 2102–2110. 2001. Anaphylatoxins and infectious and non-infectious inflammatory diseases. Mol. Immunol. 38: 175–187.
. 1992. Hypocomplementemia and leukocytosis in diarrhea-associated hemolytic uremic syndrome. Nephron 62: 296–299.
. 1984. Renal histopathology in the hemolytic-uremic syndrome following shigellosis. Clin. Nephrol. 21: 126–133.
. 1980. The complement system in hemolytic-uremic syndrome in childhood. Clin. Nephrol. 13: 168–171.
. 2009. Alternative pathway of complement in children with diarrhea-associated hemolytic uremic syndrome. Clin. J. Am. Soc. Nephrol. 4: 1920–1924.
. 2009. Shiga toxin activates complement and binds factor H: evidence for an active role of complement in hemolytic uremic syndrome. J. Immunol. 182: 6394–6400.
. 1985. The association between idiopathic hemolytic uremic syndrome and infection by verotoxin-producing Escherichia coli. J. Infect. Dis. 151: 775–782.
. 2005. Application of combined high-performance thin-layer chromatography immunostaining and nanoelectrospray ionization quadrupole time-of-flight tandem mass spectrometry to the structural characterization of high- and low-affinity binding ligands of Shiga toxin 1. Rapid Commun. Mass Spectrom. 19: 3659–3665.
. 2008. Factor H dysfunction in patients with atypical hemolytic uremic syndrome contributes to complement deposition on platelets and their activation. Blood 111: 5307–5315.
. 1997. Abrogation of the alternative complement pathway by targeted deletion of murine factor B. Proc. Natl. Acad. Sci. USA 94: 8720–8725.
. 2002. Differential tissue targeting and pathogenesis of verotoxins 1 and 2 in the mouse animal model. Kidney Int. 62: 832–845.
. 2004. Hemolytic uremic syndrome induced by lipopolysaccharide and Shiga-like toxin. Pediatr. Nephrol. 19: 485–489.
. 1997. The P-selectin glycoprotein ligand-1 is important for recruitment of neutrophils into inflamed mouse peritoneum. Blood 90: 1934–1942.
. 1988. Interaction of human monomeric C3b with its receptor (complement receptor type 1, CR1) on neutrophils. Evidence for negative cooperativity. J. Biol. Chem. 263: 5091–5097.
. 1988. Identification of distinct C3b and C4b recognition sites in the human C3b/C4b receptor (CR1, CD35) by deletion mutagenesis. J. Exp. Med. 168: 1699–1717.
. 2004. Novel functions of thrombomodulin in inflammation. Crit. Care Med. 32(5 Suppl): S254–S261.
. 2002. Tissue-type plasminogen activator (t-PA) is stored in Weibel-Palade bodies in human endothelial cells both in vitro and in vivo. Blood 99: 3637–3645.
. 2006. A murine model of HUS: Shiga toxin with lipopolysaccharide mimics the renal damage and physiologic response of human disease. J. Am. Soc. Nephrol. 17: 3404–3414.
. 2006. Platelet Toll-like receptor expression modulates lipopolysaccharide-induced thrombocytopenia and tumor necrosis factor-alpha production in vivo. Blood 107: 637–641.
. 2006. Complement activation contributes to both glomerular and tubulointerstitial damage in adriamycin nephropathy in mice. J. Immunol. 177: 4094–4102.
. 2000. Complement is activated in kidney by endotoxin but does not cause the ensuing acute renal failure. Kidney Int. 58: 1580–1587. 2001. Complement. First of two parts. N. Engl. J. Med. 344: 1058–1066.
. 1995. Platelets roll on stimulated endothelium in vivo: an interaction mediated by endothelial P-selectin. Proc. Natl. Acad. Sci. USA 92: 7450–7454.
. 2009. Coagulation and innate immune responses: can we view them separately? Blood 114: 2367–2374.
. 1998. A targeted point mutation in thrombomodulin generates viable mice with a prethrombotic state. J. Clin. Invest. 101: 1983–1991.
. 1990. Plasma thrombomodulin in health and diseases. Blood 76: 2024–2029.
. 2010. Reducing agents induce thrombomodulin shedding in human endothelial cells. Thromb. Res. 126: e88–e93.
. 2002. Kinetics of thrombomodulin release and endothelial cell injury by neutrophil-derived proteases and oxygen radicals. Immunology 107: 340–349.
. 1978. The human complement system in thrombin-mediated platelet function. J. Exp. Med. 147: 1713–1726.
. 1995. Activated platelets in paroxysmal nocturnal haemoglobinuria. Br. J. Haematol. 91: 697–702.
. 1997. The role of lipopolysaccharide and Shiga-like toxin in a mouse model of Escherichia coli O157:H7 infection. J. Infect. Dis. 175: 611–620.
. 2009. Shiga toxin-2 results in renal tubular injury but not thrombotic microangiopathy in heterozygous factor H-deficient mice. Clin. Exp. Immunol. 155: 339–347.
. 1991. High incidence of serum antibodies to Escherichia coli O157 lipopolysaccharide in children with hemolytic-uremic syndrome. J. Pediatr. 119: 380–385.
. 2001. Response to Shiga toxin-1, with and without lipopolysaccharide, in a primate model of hemolytic uremic syndrome. Am. J. Nephrol. 21: 420–425. 2001. Endothelial cells: they only look all alike. Blood 98: 1644.
. 2005. Signaling through up-regulated C3a receptor is key to the development of experimental lupus nephritis. J. Immunol. 175: 1947–1955.
. 2004. Effect of eculizumab on hemolysis and transfusion requirements in patients with paroxysmal nocturnal hemoglobinuria. N. Engl. J. Med. 350: 552–559.
. 2003. Pexelizumab, an anti-C5 complement antibody, as adjunctive therapy to primary percutaneous coronary intervention in acute myocardial infarction: the COMplement inhibition in Myocardial infarction treated with Angioplasty (COMMA) trial. Circulation 108: 1184–1190.
. 2009. Eculizumab for atypical hemolytic-uremic syndrome. N. Engl. J. Med. 360: 542–544.
. 2009. Eculizumab for congenital atypical hemolytic-uremic syndrome. N. Engl. J. Med. 360: 544–546.